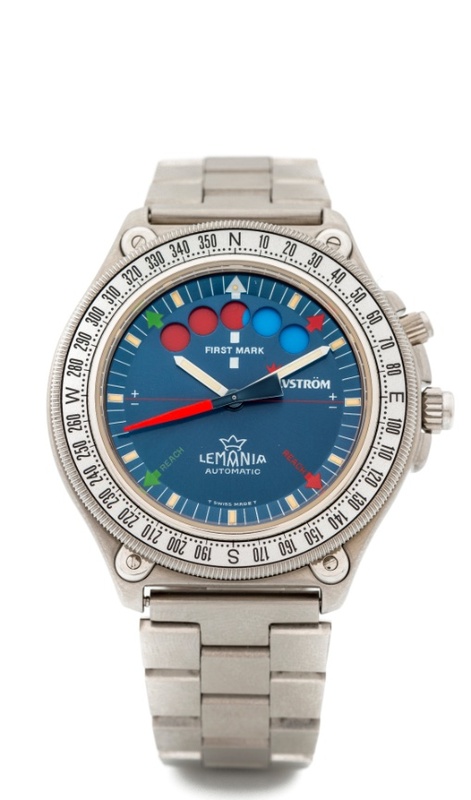 At the beginning of the 1970’s one of Lemania’s star designers Albert Piquet developed the regatta caliber 1345 for Aquastar, based on their patent for a 10 minutes countdown timer. The regatta caliber 1345 is derived from the 1341 movement, and is the successor of the first regatta movement, the caliber Felsa 4000N (by the earlier 5 minutes count-down timer patent from Aquastar from the 1960’s). After the introduction of the Aquastar Regate the Lemania 1345 movement comes available for other brands as well and several case versions of the Yachttimers are sold by Aquastar and Tissot. In the 1980’s also Omega, Heuer and Lemania itself used the 1345 movement in different regatta watches. In the late 1980’s Lemania goes into a partnership with Jean-Daniel Dubois and Paul Elvström, a well-known Danish competitive sailor, for a re-issue of the yacht timer. This resulted in a patent being filed in 1991 and in the Lemania Elvström, powered by the same caliber 1345 regatta movement but with a more modern design of the case. The model now has a rotating bezel and the tactical P.E. (Paul Elvström) system printed on the dial.